I was (happily) chosen to swatch the next little collection from Anne Kathleen, which makes me clap my hands like a two year old. This one is perfect for late Fall...especially if you need the shinies. Make sure you read this whole post, because there is some important Black Friday info at the bottom! I'm pretty cool toned, so a lot of warm cognac colors like these look weird on my skin. I actually like these quite a bit...and not just because shiny. Because the shades are pretty neutral (even the gold glitter. No. I promise) I am naming this whole collection SFW. Also awesome. Thana is a delicate gold "glitter" with a scattered holo. Officially this is "...a glitter topper chock-full of extremely fine gold holographic pigments that mimic glitter." I totally agree with that, because this does not attach itself to you like regular glitters (thank god). I needed two coats for the pictures below, and it behaved nicely with a top coat. It looks amazing in the sunlight...but you will have to take my word for that. We got some much-needed rain here, which is great...but couldn't it have waited another 20 minutes?! Lauda is a medium tan-gold shimmery polish with a scattered holographic fine gold. Which is why I think I find it wearable. When the sun comes back, I think I want to try layering Thana and Lauda, because I feel like blinding people. This polish is a little thicker (almost frothy) but it still behaves well. I needed two normal coats for this one. I was worried because of the pearly-shimmer that I would need a sponged on layer...but nope. It is packed with pigments, so you might want to use a top coat sammich for this one if you really need that ultra glossy finish. I only used a thin layer of Seche Vite, and I think it is shiny enough. Sana might be my favorite. To me, this looks like pumpkin pie and a disco ball had a fabulous baby. This one was described to me as a dark brown...but my pedantic brain wants to argue with that. Its a warm, medium brown I think. I also think this should be the official color of November. It is perfect. Flattering on warm and cool tones, light or dark skin...just perfect. If you buy one, make it this one. What better way to wear sparkle in the office? I would call this one a light-to-medium warm brown. Again, it is a scattered holo and totally office-safe. I love Oksana as well, though she loves me slightly less. Another great neutral with a kick though, and should definitely be in your shopping basket. It has a decidedly textured finish without top coat, but doesn't require the top coat sammich. I used a single normal layer of Seche Vite below. So what do you think? Do you have a favorite? I obviously do. Now for the important stuff: sale info! 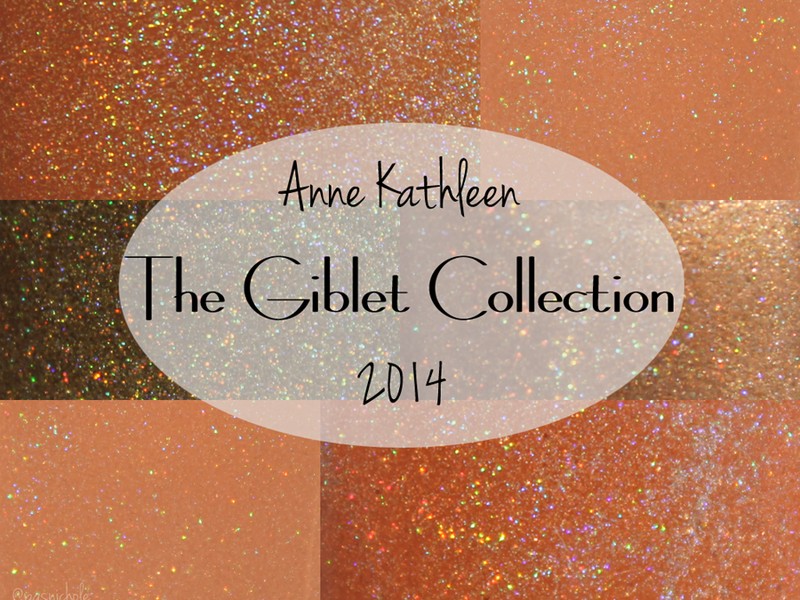 Anne Kathleen will be having a special promotion on Black Friday, and all Black Weekend. These look stunning! They are all really great colours. My favourite is definitely Thana and Sana comes in close second!